Salesforce have the ability to integrate with social network out of the box, if you not see this in your Salesforce environment, contact your Salesforce admin to turn it on, but make sure to get approval internally. 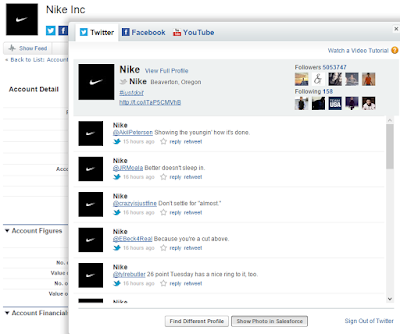 It called as Social Accounts and Contacts, but actually it also enable for Lead. To enable or disable social network, go to Setup – Customize - Social Apps Integration - Social Accounts and Contacts - Settings. Each user can configure which social network they want to see in Salesforce. 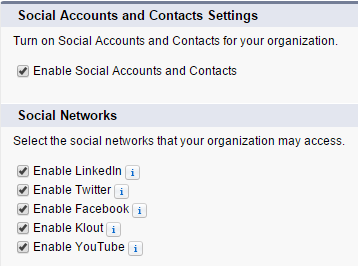 To configure, click My Settings, select Display & Layout – My Social Accounts and Contacts. 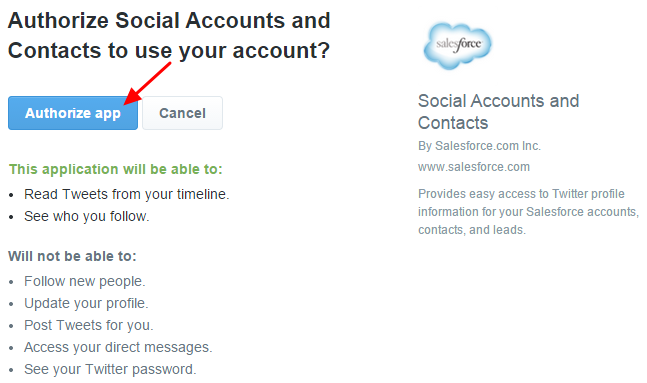 Enable and configure Social Accounts and Contacts in Salesforce enable your users to see social profiles for their accounts, contacts, and leads — directly in Salesforce. 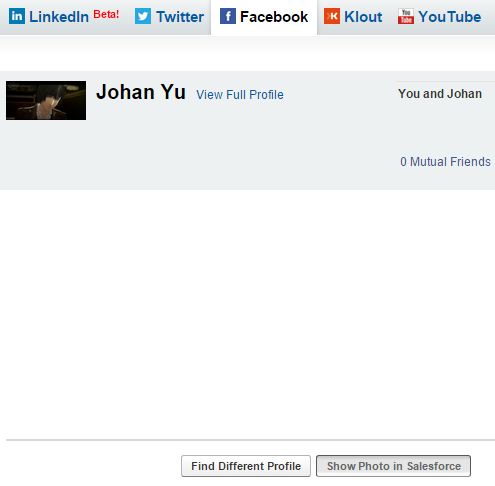 Salesforce uses the trusted OAuth protocol when you sign in to your Facebook, LinkedIn, Twitter, or accounts. 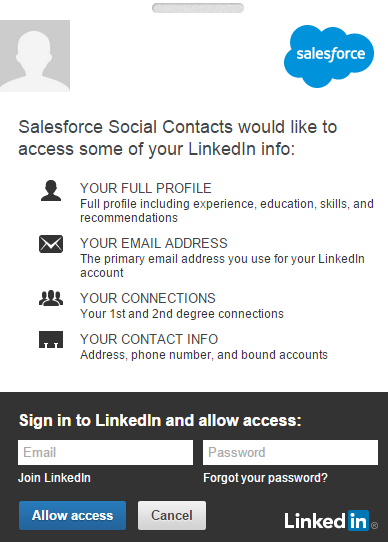 Your social media login credentials aren’t stored to Salesforce. 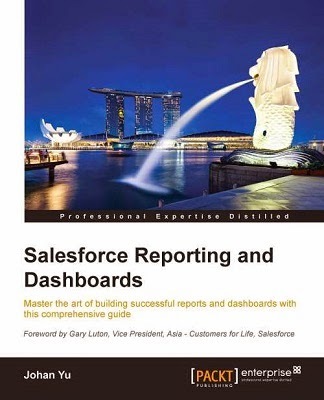 Salesforce doesn’t import or store social information. Each time you select a social profile, Salesforce retrieves the information that you want to see directly from the social network. 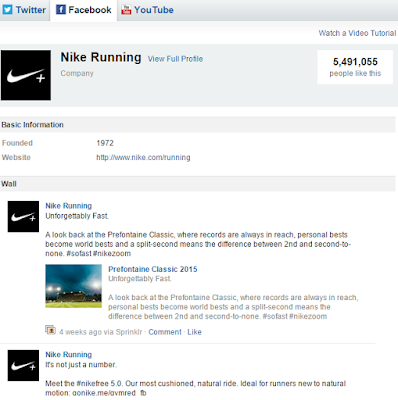 You’ll always see current social information for your accounts, contacts, and leads. 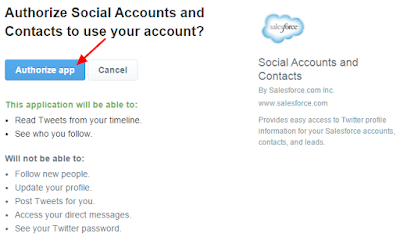 Associating a Salesforce record with a social network account doesn’t cause any activity on the social network. For example, when you associate a contact with a Twitter account, you don’t become a Follower of that account on Twitter. Salesforce never posts anything about your or your activities to your social network accounts. 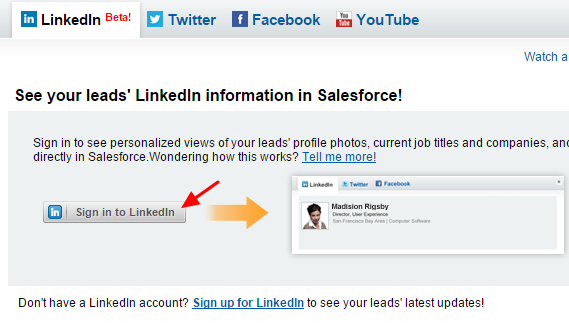 Your accounts, contacts, and leads are not notified when you use Salesforce to view their social network profiles. Your view of a Facebook, LinkedIn, or Twitter profile is unique to you and depends on how you’re connected with each account, contact, or lead on each social network. Only users with edit right to that record able to associate social network profile to the record. Records associated with a social network profile will have photo from social network show in Salesforce record. Once an account, contact, or lead is linked to a social network profile, you and everyone else in Salesforce can access current social data. 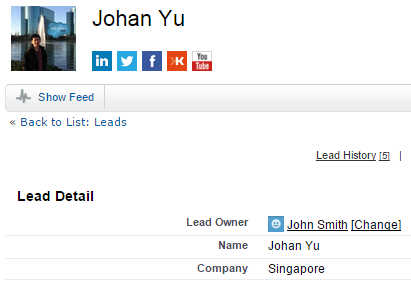 Account, contact or lead associated with a social network profile, Salesforce always displays current information about it. 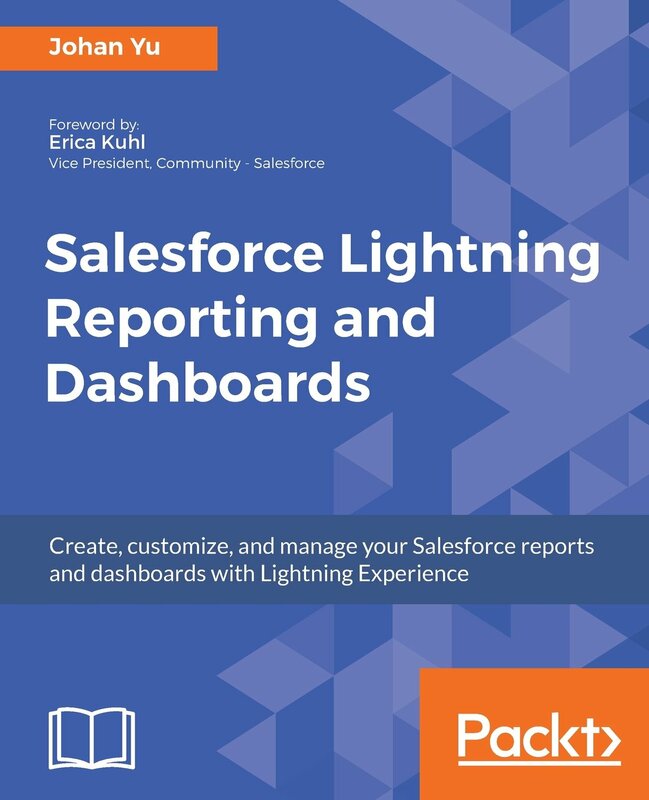 The details that each Salesforce user can see depend on how they’re connected with the account, contact, or lead on the social network, as well as the privacy settings for the profile. Your social network account will be keep login in Salesforce, even you have logout from Salesforce, until you sign out from your social network manually. 3. Enter your Twitter username and password, then click Authorize app button. At this screen, it will list down what this app will and will not able to do. 4. 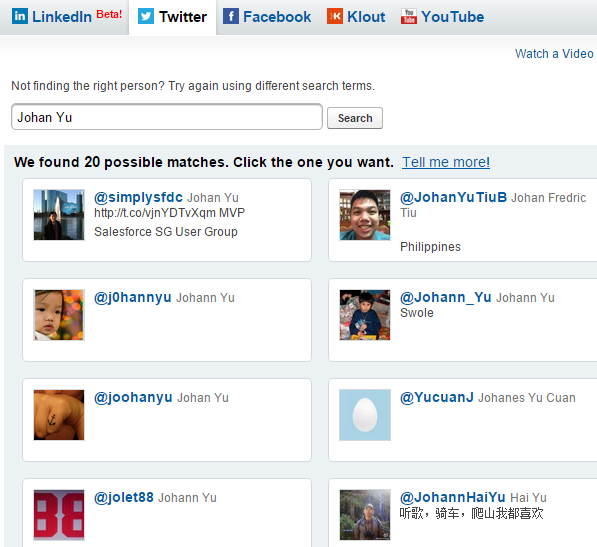 For Twitter, Salesforce will search to Twitter profile based on First Name and Last Name. Select a user to continue. 7. If user click reply or retweet in Salesforce, it will open Twitter website for that user. 8. When other user open the Lead or Contact, photo assigned from social network to that Lead or Contact will be shown. If that user haven't enter their Twitter login credential, click Twitter icon will be asked to login to their Twitter account. 9. Other users without edit permission to the Contact or Lead will not able to link that Contact or Lead to Twitter account (including set photo). Below screenshot taken from user without edit permission to the Contact or Lead, notice the buttons are missing. 3. 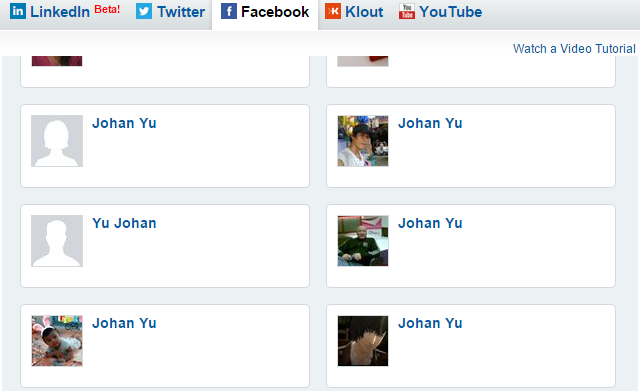 For Facebook, Salesforce will search Facebook user based on First Name and Last Name. Select a user to continue. 4. It will show if you have any mutual Facebook friends between you and the Contact or Lead. If any other social network assigned earlier to the Lead or Contact by anyone, this will overwrite it. 5. Click “View Full Profile” will open Facebook page for that user. 6. When other user open that Lead or Contact, photo from social network linked to that Lead or Contact will be shown, When user click Facebook icon, user will be asked to login to their Facebook, if that user never did it earlier. 4. 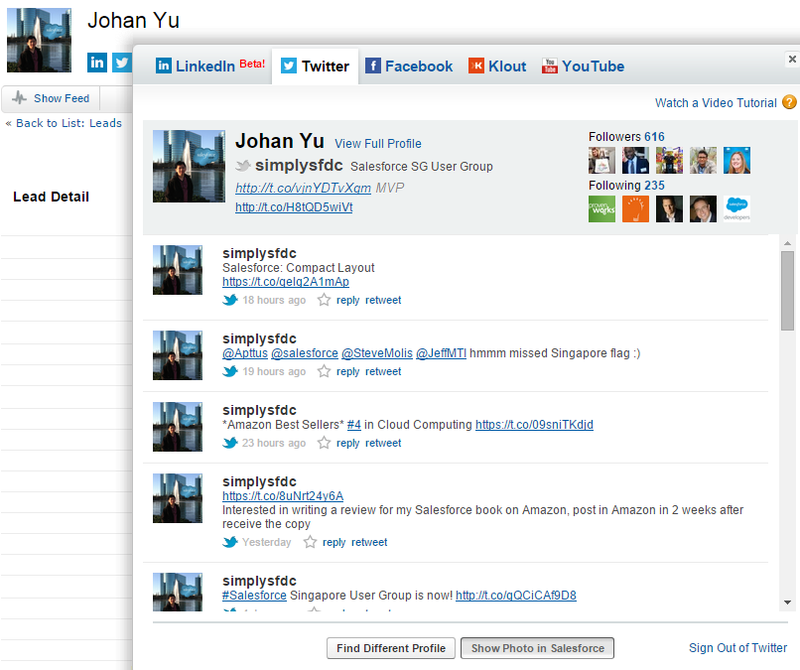 For LinkedIn, Salesforce will search to LinkedIn user based on First Name, Last Name and Company. Select a user to continue. 5. 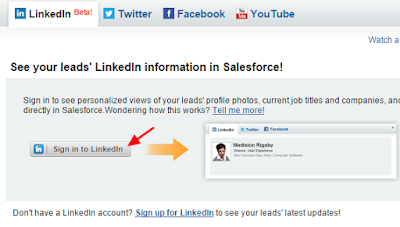 To see full LinkedIn profile of Contact or Lead in Salesforce, you have to subscribe to LinkedIn Premium plan, otherwise you will only see photo, name, and professional headlines of that user from LinkedIn. 6. 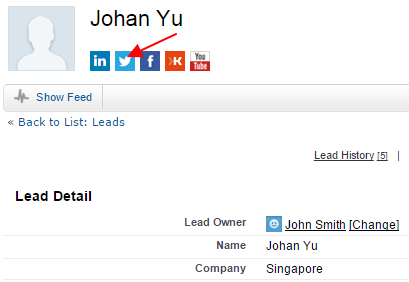 When other user open that Lead or Contact, photo from social network linked to that Lead or Contact will be shown, When user click LinkedIn icon, user will be asked to login to their LinkedIn account, if that user never did it earlier. 1. Same login process with Lead / Contact, it will search Account Name by default. 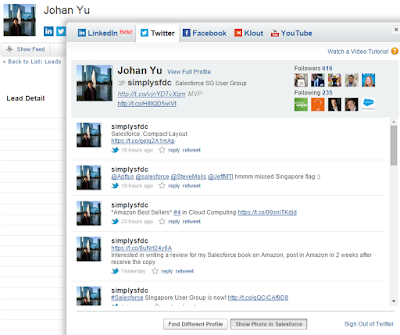 You will be able to see the tweets linked to the Account in Salesforce. 1. 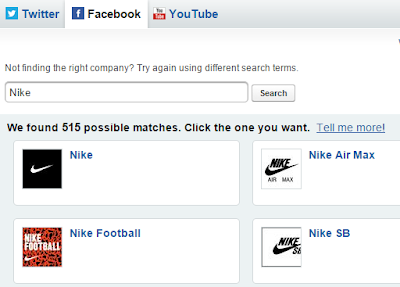 Instead of searching for Facebook user, this will search for Facebook Page. 2. When user select the Facebook page, it will show the company profile page in Facebook.